Ryan Reynolds has demonstrated his complexity and talent as an actor in many ways; but The Voices displays his strangest and most interesting role to date. Reynolds stars as Jerry Hickfang, a psychopath who experiences hallucinations on a regular basis, which causes him to talk to his pet dog Bosco and pet cat Mr. Whiskers. They influence his day to day actions, and soon Jerry's deranged outlook on life takes him down a very dark path. 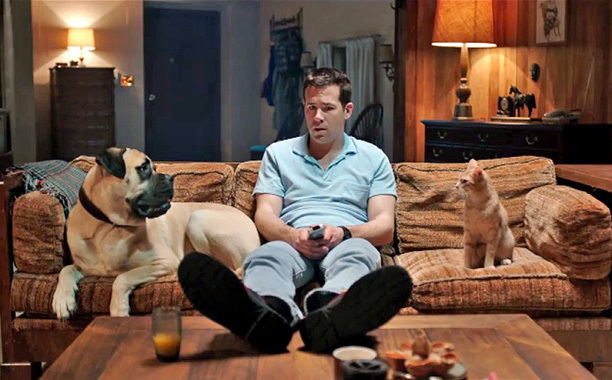 The Voices definitely likes to produce laughs from the most taboo subjects; this includes murder, disembowelment, torture, and all kinds of violence - if you can take such controversy, then you'll find much to enjoy. There's a bittersweet combination of unsettling scenes and extremely funny ones; a lot of the comedy stems from the dim-witted yet loving Bosco and the conniving Mr. Whiskers, whom Reynolds also voices so superbly. The Voices also acts as an interesting analysis of a psycho's mindset, showing us how the real world is far more grim than the hallucinated fake one some of these people live within. However, as Jerry enjoys his happy life within his hallucinated utopia, he fails to acknowledge the harm some of his actions have on others. The film conveys this with some brilliant aesthetic design, splitting between bright and happy scenics in Jerry's vibrant hallucinations and dark, frightening imagery when the reality of the world around him comes into place. Reynolds gives one of the best performances of his career in all of his roles, and he's supported by an equally entertaining (albeit slightly forgettable) supporting cast comprised of Gemma Arterton, Anna Kendrick, and Jacki Weaver. Reynolds leaps between Jerry's light hearted yet disturbing persona and his angered, distressed one flawlessly, creating a character that's both likeable yet extremely intimidating. His voices for Bosco and Mr. Whiskers also demonstrate his ability to flex his voice in a convincing way. 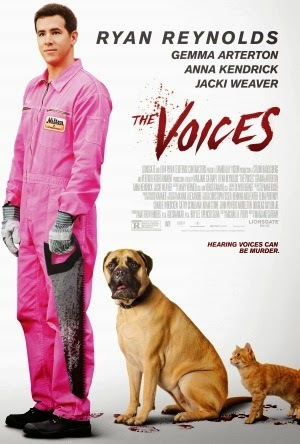 It's dark sense of humour won't appeal to everyone, but The Voices still a fine piece of work nonetheless.